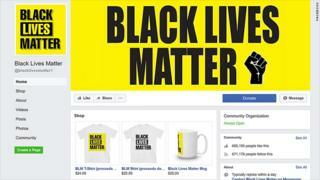 The biggest Facebook page linked to the Black Lives Matter movement was a scam run by a white man in Australia and has been taken down, CNN has reported. It was part of a wider operation which raised more than $100,000 through online fundraising platforms, which have suspended linked accounts. Facebook founder Mark Zuckerberg is due to answer questions from US politicians today, as the platform faces renewed scrutiny over its practices and integrity. The investigation - by CNN's Donie O'Sullivan - raises more awkward questions for the advertising and social media giant, as well as others. Patrisse Khan Cullors, one of the founders of the Black Lives Matter movement, tweeted that they had asked Twitter to remove an associated account. She told CNN that Black Lives Matter had contacted Facebook several months ago to raise concerns about the page, which has twice as many likes as the official page. We deal with the co-option of our work locally, nationally, and globally. The page was suspended by Facebook due to an administrator's account being suspended, not apparently for a breach of community standards. It was then taken down by one of its administrators after CNN contacted Ian Mackay, one of the Australian men the news organisation believes is associated with administration of the page. Where is Black Lives Matter headed? Pointedly, CNN says that "not for the first time, Facebook took action against a major bad actor on its site not on its own but because journalists made inquiries." Suspicions about the site date back to 2016, according to O'Sullivan. His report highlights the work of Jeremy Massler, whose blog post in December 2017 first raised the links to Mackay and brought them to the attention of CNN. Separately, Australia's SBS reports that Mackay has been sacked from his role as an official with the National Union of Workers (NUW), along with another unnamed official. The people behind the page also ran multiple fundraising pages on platforms including Donorbox, Paypal, Patreon. It is claimed they raised about A$129,000 ($100,000, £71,000) and that some of the funds had been tied to an Australian bank account, with one fundraiser linked to Mackay by name. When contacted by CNN, Mackay denied running the page, telling them that he had only bought a domain name and had subsequently sold it.